Get ready for the night of your life, Florida Georgia Line fans! The two-piece is back on the road for the Can't Say I Ain't Country Tour, which sees the pair performing hit singles like “Sittin’ Pretty,” “Colorado,” “Simple” and “Talk You Out Of It” from their new sensational album! 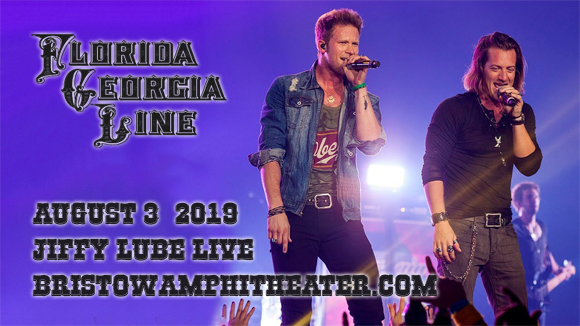 Joined by special guests Dan and Shay & Morgan Wallen, the dynamic duo comes to Jiffy Lube Live on Saturday 3rd August 2019! Signed to Nickelback producer Joey Moi's Big Loud Mountain Records label in 2011, bro-country duo Florida Georgia Line scored an instant hit with their 2012 debut single "Cruise". Downloaded over seven million times and staying at number one on the Billboard Hot Country Songs chart for 24 weeks, the single broke two major sales records. The duo followed with their debut album, Here's to the Good Times, in December of that year. Here's to the Good Times became the sixth best-selling album of 2013 in the United States and was certified double-platinum by the RIAA. The duo's upbeat lyrics about trucks, parties and romance coupled with their modern take on country music define the "bro-country" genre and have heavily influenced the modern country sound. Florida Georgia Line's fourth studio album, Can't Say I Ain't Country, is released in 2019.